Depression is epidemic in our society, Seligman (Psychology/Univ. of Penn.) claims, because of hyper-individualism, the waning of faith in religion and government, and a bewildering range of choices. Seligman's agenda here is no less ambitious than to offer a program that anyone can use to conquer depression by learning a "flexible" optimism. Building on his theory of learned helplessness, whereby animals given inescapable shock simply gave up even when later presented with a chance to escape, Seligman and his colleagues at Penn have sought to identify what it is that engenders such hopeless passivity. Extending his studies to humans, he has developed the notion of "explanatory style," our way of accounting to ourselves for the causes of adversity. Pessimists see the causes as permanent, pervasive, and personal, while optimists view them as temporary, limited, and external to themselves. But pessimism can be changed, Seligman maintains, through the techniques of cognitive therapy, which teaches people to recognize their automatic, negative responses and to dispute them. 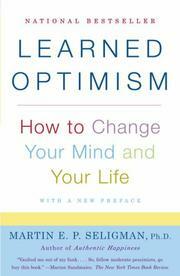 The book gives detailed instructions on implementing these techniques and argues for making the effort by citing the results of Seligman's 25 years of research on optimism: Optimists do better in school, sports, and business, are more likely to be elected to political office, are healthier and may even live longer. While skeptics (or pessimists) may question whether we have as much control over our emotions as Seligman asserts, he does offer valuable laboratory evidence for the much-discussed mind/body connection in this provocative self-help book that rises far above the pack.